Keio Plaza Hotel Japan Launches Hello Kitty Rooms! You are here:Home » Travel » Keio Plaza Hotel Japan Launches Hello Kitty Rooms! It's Hello Kitty's 40th Anniversary ( ハローキティ誕生40周年を記念 ), and fans around the world celebrated the Japanese kawaii icon's birthday with mass parties, and I was exhilarated to be part of this celebration! It was a massive event as the world gathered together to celebrate Hello Kitty's 40th Anniversary. So there I was in Tokyo for a week, joining the Japanese media to be among the first to preview the Hello Kitty rooms by Keio Plaza Hotel ( 京王プラザホテル ) launched on November 1, 2014! In partnership with Sanrio Company Ltd, Keio Plaza Hotel Japan unveils 2 very special Hello Kitty Rooms - "Kitty Town" and "Princess Kitty"! Offering hotel guests a beautiful sleep in a fairytale land, these pretty #hellokitty rooms feature amenities, furniture and interiors of the internationally renowned Hello Kitty character with a different feel - “Kitty Town” room with a fun, pop-art feel, while the “Princess Kitty” room let you relax like a fairytale princess. Which do you like better? The Hello Kitty rooms are now opened for booking at Keio Plaza Tokyo ( 京王プラザホテル新宿 ) and Keio Plaza Tama ( 京王プラザホテル多摩 ). Global: Hello Kitty Hug-a-thon - Share a Hug with Hello Kitty, a global "hugathon" event. Hong Kong: Hello Kitty Carnival - the exhibition featured a life-sized carousel, a Ferris wheel, and stalls for carnival games. Singapore: Hello Kitty Run - 17,000 fans gathered for a 4.2-kilometre Hello Kitty Run to celebrate the anniversary on Saturday. Taiwan: The Many Faces of Hello Kitty - 40th Anniversary Exhibition held at Pier-2 Art Centre in Kaohsiung until January 4. USA: Hello Kitty Museum Exhibition - Sanrio and the Japanese American National Museum (JANM) celebrate Hello Kitty's 40th Anniversary by exploring her colourful history and influence on art and culture in the first-ever exhibition of its kind. USA: Hello Kitty Convention - The first ever Hello Kitty fan convention in the world at the Geffen Contemporary at MOCA (Museum of Contemporary Art) in Downtown LA's Little Tokyo. Hello Kitty Con 2014 is presented in conjunction with Target and designed for enthusiasts from around the world to come together to celebrate all things Hello Kitty. If you're in Japan now, you may like to catch the Hello Kitty Trains ( ハローキティヘッドマーク付列車 ) as well. 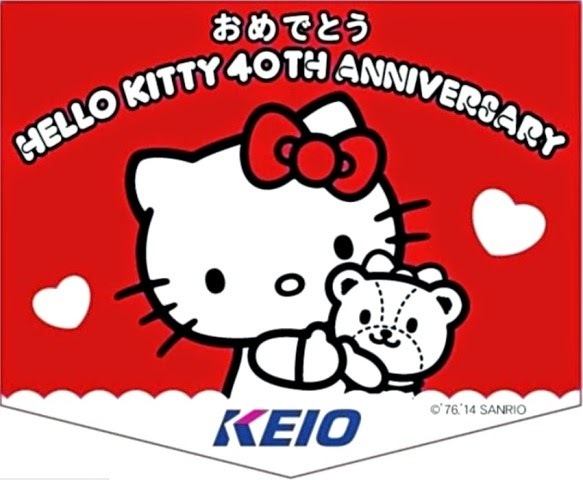 To commemorate Hello Kitty's 40th anniversary, Keio Electric Railway will run its 9040 series train with head mark of Hello Kitty mounted on the Keio Line till November 9. In addition, Hello Kitty will make its appearance as the Train Station Manager outside the ticket gate of Keio Tama Center Station on November 3 to greet the passengers. You may contact Keio Customer Center: Tel: 042-357-6161 (9:00 to 19:00) for more information. Are you a fan of Hello Kitty? Were you part of the global celebration too? Come, let's check out my reviews of the two lovely rooms at KITTY TOWN Room, A Fantasy Comes True! and Keio Plaza Hotel Tokyo Hello Kitty Princess Room At Shinjuku! DD, it's just too crazy & I love them all! Wow! Hello Kitty has been around that long??? Rose, thank you! Amazing, isn't it? Omg I'm kind of jealous the place is amazing me and my female pup love Hello Kitty. DS, wish you could join me too! Heehee! Oh my! That's so cute! Coco, hahaha! Glad to have caught your attention, dear! Wow!! What a fantastic thing - surrounded by cute kitties. Ken, hahaha! You're too cute! Glenda, I had an awesome time there! Certainly a memorable one! HW, I'm sure this is a dreamland for #hellokitty fans! Look like a fun place to stay at. Amy, it's definitely one of the best for me! Wow, this room is so full of cute Hello Kitty. Fans of Hello Kitty will love to stay in this room. PP, thanks & have a good day! Diana, I had such a lovely time there! The hotel staff are awesome! WAAAHhh! I know some girl friends who would kill to stay in that room and take photos! I've never been a giant fan but I did covet a few hellokitty items as a child, for one, this giant 3d alarm clock that my dad got me! I do love the face of hello kitty, i'm attracted to toys that have that blank face! I am a sucker for anything Hello Kitty. and that room is heaven for me. I love these rooms and I know you are a hello Kitty fan! Bal, indeed I am & I've a soft spot for kitty! wow, you looks like a little princess in the princess's kitty room Shirley. I used to love kitty when I was a child - no more since I comes a mom:). Glad you hone safely, I believed you had a great time in Japan:). Tanya, you're such a darling! My interest went the opposite way ...... used to adore Minni Mouse as a kid, but I've grown to love Hello Kitty as I aged. Lol! Kathy, hahaha! Can't wait to show you gals! Nicole, thanks for the sweet note! Uru, I'm so glad that you've found this post of interest. Thanks so much for the kind notes, sweetie! Shirley!!! kawaiiiii!!!! like in fairy tale...I am overzealous of you!!!! Welcome back and can't wait for the next post! How lucky were you to get to experience all this Hello Kitty cuteness Shirley! It looks wonderful! Welcome back sweet lady! Rowena, indeed I am! Hahaha! Thanks for the sweet thoughts, dear! I like hello kitty, but not so much that I would want to have everything with it's picture! The rooms are awesome, though! Trishie, aw! Can't believe your mom is also a #hellokitty fan! Certainly make me feel so much better now that I know I'm not the only "aunty" who adores the cute icon. Lol! YL, that's awesome! I can't imagine the amount of kitty stuff you'll squeeze into your bag. Lol! Manasi, thanks for coming by & certainly love having you around! Hong, certainly very honored to be an invited guest. Yes please, I'm sure she'll love it!